Renowned pen artist Kim Young-Taek will be holding an exhibition at the Lotte Hotel’s Lotte Gallery near Myeong-dong from Aug 2 to Sept 29. 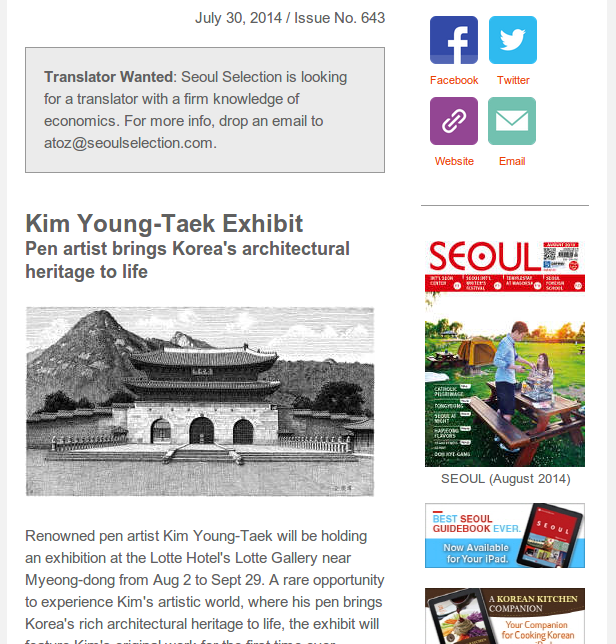 A rare opportunity to experience Kim’s artistic world, where his pen brings Korea’s rich architectural heritage to life, the exhibit will feature Kim’s original work for the first time ever. Kim has spent the last three decades capturing the sublime beauty of Korean traditional architectureâincluding some of the nationâs greatest treasuresâthrough pen sketches. Taking between 500,000 and 800,000 touches to complete each one, Kimâs sketches are more faithful representations of the buildings than even photographs. So remarkable is his work that it was even gifted to the Chinese First Lady during her and her husband’s recent state visit to Korea (you’ll be able to see the original at the exhibit). The official “opening” ceremony will be on Aug 7 at 5 PM. Oh, and if you really like his work, we’ve got a collection of his work in softcover here. A film looks at the tragedy of video game addiction in Korea. Young defectors in South Korea often regret having defected. Seoul is stepping up efforts to get some Buddhist temples registered with UNESCO. Life around the Danghyeoncheon Stream. The Yanghwa Bridge at night. Check out Seoul->Suburban’s photos in Guardian Cities. Busan Harbor seen from Mt. Bongorisan. A beautiful forest in Wanju, Jeollabuk-do. Weâd like to formally apologize for some misinformation that was printed on page 40 in the August issue of SEOUL regarding W HEAT WAVE 2014. Instead of the listed price of KRW 23,000 (40,000 for two people), admission to the event will be charged at KRW 50,000 per person (tax included). Once again, we are terribly sorry for misinforming our beloved readers. We promise to do everything we can to make sure we never commit such an error again. On a lighter note, donât miss the great opportunity to enjoy yourself in one of the cityâs best poolside parties! Stay cool with W HEAT WAVE 2014, on August 2 at the W Seoul Walkerhill Hotel. Are you in the mood for a summer barbecue but donât know where to go? Head to Dal: Bar in the hip Hapjeong neighborhood for their Sunday BBQ Party. Did we mention itâs all-you-can-eat? For just KRW 20,000 you can feast on a delectable assortment of Hanwoo beef, sausages and moreâall grilled personally by Dal: Barâs bartending staff! Escape the heat with some delicious barbecue and cool cocktails, the perfect way to wrap up the weekend. âChicagoâ is based on a 1926 play written by reporter Maurine Dallas Watkins, who wrote the script based on the actual stories she reported on regarding criminals and crimes during the 1920s. Her story was intended to be a satire that exposed the depths of gangster activity on the streets, as well as the civil corruption among government officials. It also explored the idea of criminals becoming celebrities, a theme that was later given life by figures like John Dillinger and Bonnie and Clyde. After debuting for a two-year Broadway run in 1975, it was revived in 1996 and currently holds the record for longest-running revival in Broadway history, as well as being the famed New York sceneâs longest-running American musical. In 2002, the story was made into a film that won an Academy Award and starred the likes of Catherine Zeta-Jones and Renee Zellweger. The story follows a naive but ambitious Roxie Hart who is willing to do anything to become a star and ditch her “boring” husband: infidelity, murder, lies: anything. Her rival is Velma Kelly, a seductive and famous singer who’s in jail for murdering her sister and husband after discovering they were having an affair. Roxie’s lawyer, Billy Flynn, is more a PR agent than a lawyer and sways the public into believing in Roxie’s innocence. The end result leaves you pitying all the characters but unable to cheer for any of them. One of the biggest live music events in the country, the Pentaport Rock Festival is getting more popular each summer, with bigger names being added every year. The name of the event comes from the idea of the five âportsâ around the Incheon Songdo area: Airport, Seaport, Teleport, Business-port and Leisure-port. Despite Hongdaeâs reputation for being the musical district, Incheon has been catching up; the city has been successful in producing some of the nationâs most innovative rock bands since the early 1990s, and Pentaport has been drawing audiences from around the Peninsula since 2006. Even in its first year, the festival included names like Jason Mraz and the Strokes. Now that Korea is becoming a more popular international travel destination, the acts keep getting bigger, the stages larger and the crowds crazier. This yearâs lineup includes crowd favorites such as Boys like Girls, Kasabian, the Suicidal Tendencies and Idiotape, among others. Idiotape is a Korean band that offers a refreshing alternative to K-pop idols and glossy boy bands, providing slamming dance beats with powerful electronic riffs that burst through in waves. In 2013 it was Metallica, Muse, Limp Bizkit and others, drawing a crowd of over 75,000 from all over Korea. The result was a concert that was fun, energetic and extremely popular. As a result, Hyundai Card has decided to serve up another Citybreak event this year by including acts like Maroon 5, Richie Sambora (former member of Bon Jovi and ardent fundraiser for charities), PSY, the Deftones, New Found Glory, Hoobastank, Nell, and, prepare yourself, Ozzy Osbourne. Although the British legend has been touring with his band Black Sabbath, his performance in Seoul will be his first solo act in quite some time. The name âcitybreakâ comes from the idea of breaking out of your normal routine to find something fun and exciting, something that truly stimulates your senses and makes you realize youâre alive. The facilities at World Cup Stadium are designed to be more convenient and cleaner than your average venue, making the concert experience much more pleasant. Hyundai Card believes that just because itâs a large-scale music event doesnât mean you need to lower your expectations regarding the quality of your surroundings. This exhibition is another place where you can see a collection with several works from some of the greatest masters of all time. As the name suggests, the display features original work from the likes of Monet, Rodin, Picasso, Dali, Matisse and even Andy Warhol. When assembling the collection, which includes 53 different artists in total, the Hangaram Art Museum sought to broaden Seoulitesâ artistic horizons while making these famous pieces more accessible to the public. Far from being esoteric or exclusive, the curators argue, fine art couldnât be more relevant to the daily lives of us all. The selections range from the impressionism of the 19th century to the contemporary rhythms and modern themes of the 20th century, allowing audiences to see the visual shift as art adapted and began to reflect the course the Western history. Established in 1990, the Hangaram Art Museum contains six exhibition halls and features a unique climate control system that manages humidity and temperature. Join the RAS as it takes an adventurous rafting tour along the scenic Donggang River in Gangwon-do. The Donggang River is a serpentine, 60 kilometer-long stream flowing through rugged limestone terrain in mountainous Gangwon-do’s Yeongweol, Pyeongchang, and Jeongseon counties. Besides boasting breathtaking scenery, the Donggang is an ecological jewelâas it is the only remaining virgin territory in South Korea, boasting a wealth of rare flora and fauna. It is often compared to Guilin in China, a world famous tourist destination owing to its picturesque limestone mountains. 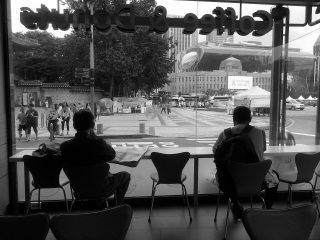 View from the Dunkinâ Donuts near Seoul City Hall. Photographed by Robert Koehler.